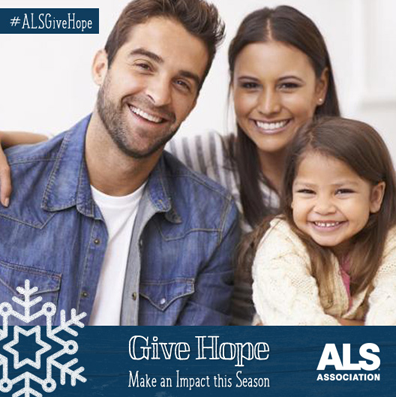 Help to advance global ALS research, provide care support and services to people living with ALS and their families, and support advocacy efforts to make ALS a national priority. Give Hope. Make an Impact. Help us fight for a world without ALS. People living with ALS tell their stories and explain how the disease has affected their lives. Your support makes a significant impact! "I didn’t know much about ALS before my diagnosis, but I became an expert pretty quick. I also got to work fighting – and not just for me but to bring hope to everyone living with ALS." "I tell people all the time that [the ALS community] is the best community I’ve ever been a part of. Anybody would jump ship at any time, if given the opportunity, but as long as we’re here, we’re in this together." Each contribution to the fight against ALS – no matter how seemingly large or small – adds up. Please consider making a year-end tax-deductible donation. Then, tell your friends why the fight against ALS matters to you and encourage them to make a contribution, too! 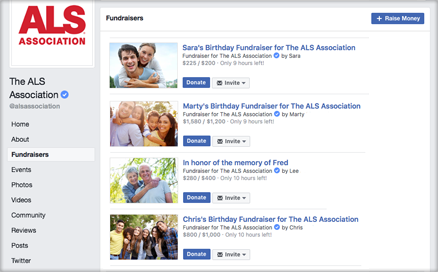 Ask your Facebook friends to donate to The ALS Association by following these easy steps. Facebook now allows people to create DIY fundraisers to help support their favorite organizations and causes. Here’s how you can help raise money for the fight against ALS. Visit The ALS Association’s Facebook page, then click on “Create Fundraiser” on the top bar. This creates a shareable page that you’ll soon customize with a title, a goal amount, and an end date. Customize your message. Share why the fight against ALS is meaningful to you and how donating to your fundraiser will have an impact for those living with this disease. Finally, fill in your goal amount. You can save and upload our holiday cover photo, or you can upload your own photo. After you select the photo you want, click “Done.” You’ll have the option to move or crop it. • Open your fundraiser page and click the “Share” button. From there, choose to either post it on your timeline again (and tag your friends) or send it in a private message. • For those friends who may not visit Facebook often, copy and paste the URL into an e-mail.